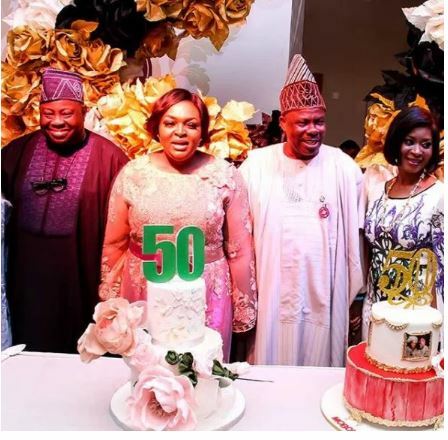 Mrs Mobolaji Abiodun Momodu, wife of Ovation Magazine publisher, Dele Momodu recently celebrated her 50th birthday in Lagos. The party which held at the prestigious Civic Centre in Victoria Island was graced by many eminent personalities led by the Ogun state governor Ibikunle Amosun. The ceremony kicked off with a Thanksgiving service led by Pastor Ojelabi while Pastor Ituah Ighodalo led the prayers for the family and laid hands on them. The highlight of the night was the cutting of the birthday cake by the celebrant, who was flanked by her family. Governor Amosun coordinated the session with the support of APC Chieftain Aremo Olusegun Osoba, Chief Alex Duduyemi, Dr. Mrs Doyin Abiola. Popular Gospel musician Evangelist Lanre Teriba was on the bandstand, dishing out great tunes that got everyone on their feet dancing. The celebrant’s mother Chief Mrs Christiana Ebun Adaramaja, her husband Chief Dele Momodu, her friend Eng. Mrs Christy Adelowo, her children, nieces, nephews, in-laws, were among those who eulogised Mrs Momodu, for being an outstanding human being and a great person to everybody. Some dignitaries at the event include; Ogun state governor, Ibikunle Amosun; APC Chieftain, Aremo Olusegun Osoba; Chief Alex Duduyemi, Dr. Mrs Doyin Abiola, Chief Mrs. Toyin Kolade, Pastor Ituah Ighodalo, Pastor Ojelabi, Pastor Femi Faseru, Sir Shina Peters, Yomi Fash Lanso, Amb. Toye and Dr Jessica Okanlawon.